After being ousted from the parliament at the general elections last year, Germany's liberal Free Democratic Party (FDP) has selected Alexander Graf Lambsdorff as its top candidate for the European elections, adopting a sober and Europe-friendly position, EURACTIV Germany reports. A big name is meant to pull the FDP out of a crisis. At the FDP convention in Bonn on Monday (20 January), 86.2% of the party’s delegates voted for MEP Alexander Graf Lambsdorff to be the FDP’s top candidate in the upcoming European Parliament elections. After failing to win enough votes to meet the 5% threshold for representation in the German Bundestag, the FDP is hoping for a second chance in European elections this May. German parliamentary elections last September, left the liberal Free Democratic Party (FDP) with its greatest defeat since 1949, winning only 4.8% of the vote. It was beaten by the Green Party (8.4%) and the former communist Left Party (8.6%). The recently formed eurosceptic movement Alternative for Germany (AfD), which advocates withdrawal from the euro currency, took 4.7% of the votes. Now, the party hopes to win back the hearts of voters with Lambsdorff, whose name is well-known in Germany. Notoriety is not yet connected to Alexander himself, but to his uncle, Otto. The latter was head of the FDP in the 1980s and German minister of economic affairs between 1982 and 1984. In contrast to his uncle, who was an ardent supporter of free market policies, Alexander Graf Lambsdorff presented himself as sober and matter-of-fact at the party convention on Monday. Lambsdorff has an impressive resume with diplomatic training as an MEP and experience working on the policy planning staff of the German foreign office for several years. “We are committed Europeans. We want to provide answers rather than conceding the field to national-alternative protest movements trying to capitalise on people’s fear”, said Lambsdorff in Bonn. 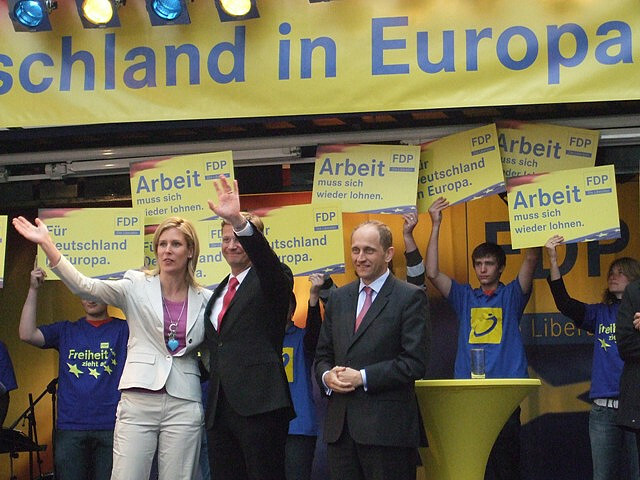 By taking this position, Lambsdorff not only differentiates himself from Germany’s eurosceptic party Alternative für Deutschland (AfD), but also from eurosceptics in the FDP’s own ranks. The euro is not responsible for the economic crisis, Lambsdorff stressed. It is the “lack of balanced budgets, decisive reforms and liberal economic policy” that are responsible, the FDP frontrunner pointed out. Lambsdorff made it clear that the FDP will not attempt to nationalise individual policy areas. At the same time, he warned of a “centralisation to a European super-state”. The measure of all things, he said, is the principle of subsidiarity which states that regulation should take place at the lowest possible level. Only after this level has proven to be overburdened, should the next level be given competence, he explained. “We do not want Europe to become more involved in everyday business”, said Lambsdorff. The FDP candidate is backed by Christian Lindner, the party’s leader. Lindner warned of a “paternal super-authority”, referred to the European Commission: “Commissioners who loudly discuss regulation of olive oil dispensers on restaurant tables; these are the Commissioners who are breaking our Europe”, Lindner said in Bonn. “Europe needs the Liberals” in the form of “pure FDP”, Lindner said of his own party. Too long has the party existed in the shadow of the CDU and it’s Bavarian sister the Christian Social Union (CSU). In the future, the FDP will work to overcome the “provincial planned economy”, instead, working toward a “European market economy”, said Lindner adding that the FDP also intends to fight for “affordable and safe” energy. Lindner accused Germany’s grand coalition of “expensive, convenient policy” financed on credit, which violates stability policy in Germany and in the rest of the eurozone. He said, the FDP’s main opponent in the European elections will be the Social Democrats and not the “backward moving group” from Germany’s eurosceptic AfD. Still, in the latest German Bundestag elections the FDP lost a considerable number of votes to the AfD, said David Bebnowski from the Göttingen Institute for the Study of Democracy. The liberal FDP was not able to appease eurosceptic voters within its own ranks. “The AfD warns of current dangers within the eurozone which have hardly been articulated in Germany,” said Bebnowski. Therefore, the political scientist advised all political parties in Germany to directly confront demands from the AfD. The atmosphere at the party convention was highly competitive, as FDP politicians fought for a place on the European candidate list. The FDP knows it will not be able to repeat its success from the 2009 elections after suffering a crippling loss in 2013. With much to lose, the stakes are high for representation in the European Parliament. The runner-up behind Lambsdorff is MEP Michael Theurer, followed by Gesine Meißner, Nadja Hirsch and Wolf Klinz. During the European Parliament elections in May, each member state has the right to elect a fixed number of Members of the European Parliament (MEPs) based on population. See more on European Parliament elections here.